For the uninitiated, Running with Rifles looks like a digital version of small plastic army men where stray bullets come from all directions and unavoidable random death is a certainty. The controls are as simplistic as the graphics relying on WASD for movement and pressing the left mouse button to shoot wherever your reticule is aimed. For the first hour of gameplay, my overarching strategy was to run with my rifle on full auto in a perpetual meat grinder that slowly progressed across the map to victory. Gradually, I started to realize that Running with Rifles isn't nearly as shallow as its title, graphics, and controls imply. In fact, tactical thinking and measured actions are the keys to success. Urban environments provide ample cover but few genuine defensive hardpoints. I was able to mindlessly blow through early single-player forays but hit a brick wall in a map that challenged three factions to capture and hold a central point for five minutes. No team was able to be the king of the hill for more than a minute and after about an hour of back and forth it became evident that the stalemate wasn't going to end. It was at this point that I climbed up to a sniper perch with the intention of picking off a few enemies. To my surprise, the height difference and cover it afforded made a massive difference. I quickly locked down a choke point and stifled an entire team's progress while racking up a personal best kill streak. A well placed grenade finally took me about but this first glimpse into the complexity of the battlefield was like playing a whole new game - a game where measured offensives with steady movement through natural cover and the occasional pincer flank transform a chaotic battlefield into a highly predictable system that demands smart decision making. Despite the title, running with a rifle is seldom a decision that leads to efficient victory. After speaking to a few other players, I learned that my experience was far from unique and definitely the product of smart design. As you invest more time in the game, you rise through the ranks and gradually unlock new features to play with. Early unlocks include the gamut of typical weapons ranging from machine guns to sniper rifles. Each firearm employs a different strategy but none feels stronger than the other and choice is broadly dictated be personal preference. Later unlocks include the ability to call in air-strikes and, eventually, issue commands to platoons of soldiers. The time investment for each unlock ensures that the usage limited tools (for example calling in a tank) that have the most potential sway over battle are given to those with sufficient experience to understand when and how to use them. 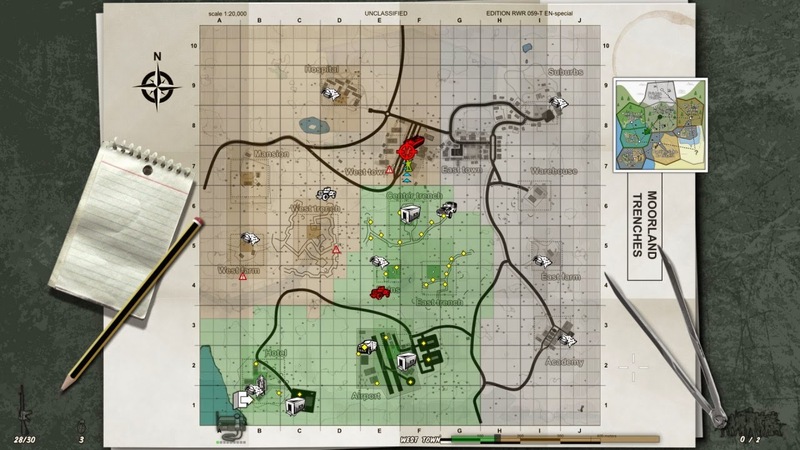 Zones of control determine spawn points and roughly gauge which side is winning. The single-player AI can put up a good fight and will consistently punish you for running into the open. 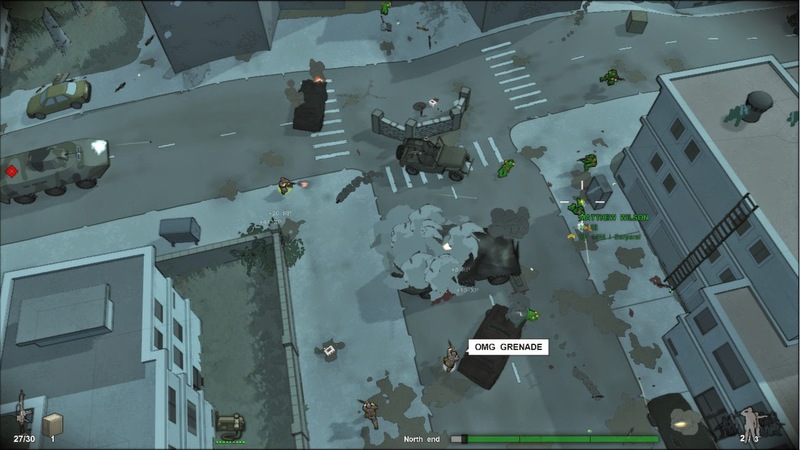 Commanding troops is context sensitive to the right mouse button and a platoon will generally grab appropriate cover instead of bunching together or leaving themselves exposed. While I preferred to personally hold choke-points while commanding troops to capture a nearby objective, I never worried that the AI would suddenly forget how to aim if I reversed the roles. A commanding general dictates where to defend or attack on the battlefield and understands the value of consolidating territory and not overcommitting. Listening to the general instead of playing Rambo with my platoon was the second major lesson I learned. That said, the AI is woeful when it comes to controlling vehicles and will frequently crash into obstacles or choose illogical routes. Hopefully vehicle intelligence will improve with patches but, in it's current state, the overall experience isn't ruined. While the single-player AI is competent and is a great way to practise, where Running with Rifles truly shines is multiplayer. Most stable servers run with 64 human player slots accompanied by around the same number of bots. The teamwork of veteran players is a sight to behold. It's not uncommon to see a machine gun lay down suppressing fire while a sniper angles to expose an enemy flank thus allowing riflemen to make steady progress. Capturing a point as part of a solid team offensive is a satisfying feeling and I felt the simplistic controls meant that losses were never the result of an overly talented sniper scoring headshots from unreal distances but almost always the product of a breakdown in strategy. When both sides are playing smart, battles can last for several hours of intense skirmishes before a winner emerges - simply epic. As one Steam reviewer succinctly put it, “Running with Rifles delivers more great Battlefield moments than any recent entry in the series”. I still remember the intimate details of games played over a decade ago in Battlefield 1942 so I consider the comparison high praise. Few games are able to capture the grand scale tactics of a warzone in the way that classic Battlefield can but Running with Rifles does so with aplomb and without feeling like a rehash.